FOR ten years, Arthur D. Hill, Jr., a California commercial fisherman, has been observing and studying how the vibrating tails of fish enable them to dart through the water at great speeds. He also noted that birds, with their flapping wings, were still more efficient in flight than the most modern of airplanes with fixed wings. Puzzling out the principles involved, Hill determined to combine the methods of bird and fish, and he has finally developed an odd fishtail drive for Propelling model airplanes, and boats ranging from toy craft up to vessels thirty-five feet in length. On tiny boats having a single rudder, Hill’s fishtail mechanism is vibrated back and forth by means of an ordinary door-bell buzzer, powered by two dry-cell batteries. By reversing the rudder, the flutterings cause the craft to move backward. Dry-cell batteries also power the vibrating wings of Hill’s model airplane, shown in the photograph above. When suspended from the ceiling on a string, the little ship whirls around a circular course, its wings whirring so rapidly that they become invisible. 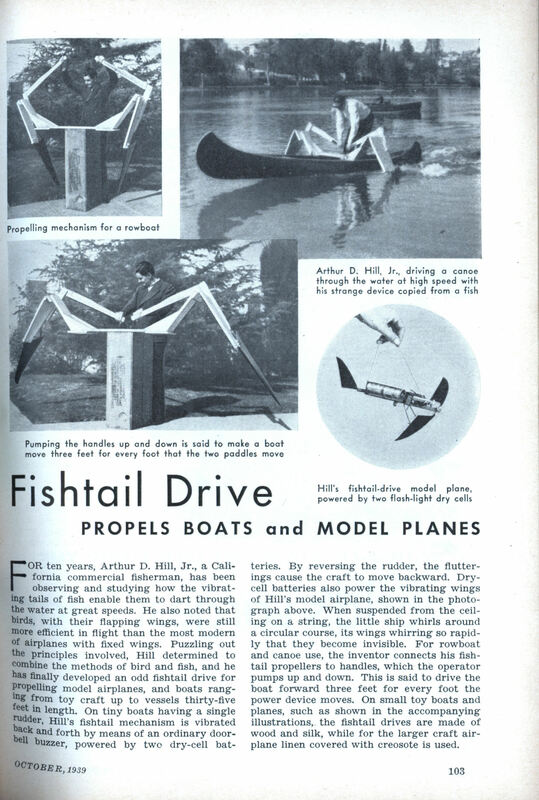 For rowboat and canoe use, the inventor connects his fishtail propellers to handles, which the operator pumps up and down. This is said to drive the boat forward three feet for every foot the power device moves. 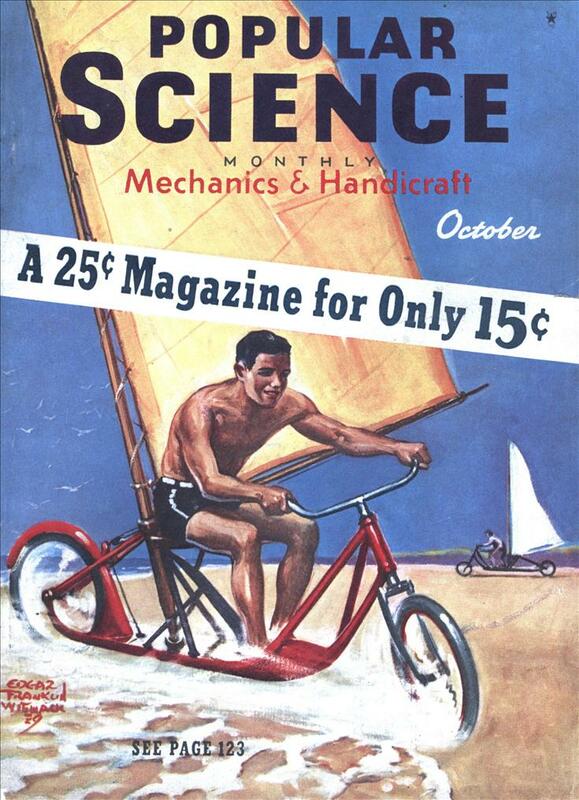 On small toy boats and planes, such as shown in the accompanying illustrations, the fishtail drives are made of wood and silk, while for the larger craft airplane linen covered with creosote is used. welcome to the Hobie Mirage.